For all lovers of Lapis Lazuli and pearls. A tasteful design that will stand the test of time. Semi precious Lapis gemstones, in tube style and 10mm A grade round beads, adds exceptional beauty, to this long white button and blue pearl necklace. Teamed with all sterling silver, and lovely pearl encrusted fob chain clasp, this surely is elegance – plus! This can be worn as a double strand or long and even wrapped around the wrist as a chunky bracelet. The matching earring in facetted rich blue lapis, hangs on a double sterling silver chain with a 10mm white round pearl. This style will never date and looks fabulous on all things blue, white, lime green, red, and purple and can certainly be worn as a statement earring. on their own. 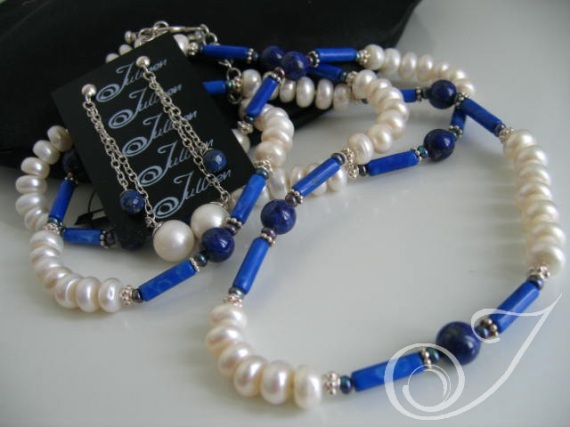 A genuinely lovely pearl and lapis luzuli jewellery set that can be worn night or day. Helen of Troy Lapis Drop Earrings or contact us and quote product code VND007.02 for the necklace.